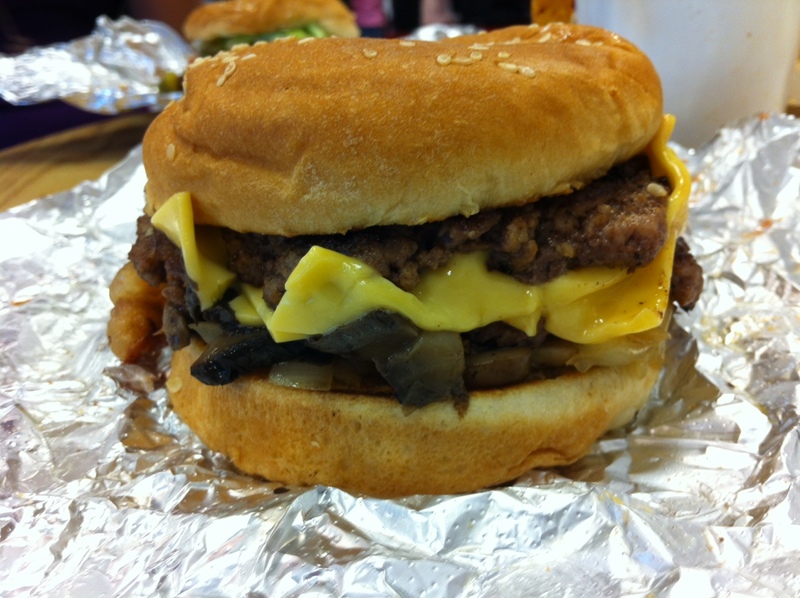 There's something beautiful about Five Guys. It makes sense that this burger chain has been compared to In-N-Out, because of this menu simplicity and a focus on creating the straight-up tasty, but Five Guys is like the evolution of In-N-Out: all the crazy toppings you can't get there, you can get here. And then some. So for my first Five Guys burger, I focused on the one thing just about everybody wants but can't get on a burger from In-N-Out—bacon. To the standard bacon cheeseburger—which has a double patty, mind you—I added sauteed mushrooms and onions, skipping the fresh crisp veggie stuff. Five Guys brings the all-American burger taste, slightly greasy, loosely packed beef smothered in melted American cheese. The bacon was crisp and my other toppings were flavorful, and the spongy bun also reminded me of In-N-Out without the shiny, buttery top. In my 'hood, we've got this new Five Guys, In-N-Out a couple blocks down, and Smashburger across the street. That's a pretty strong burger battle.